The New Age WRX STi is available in both 4 door and 5 door format, and as expected come with the 280PS (276bhp) engines. The STi see a number of new features, never before seen on a Subaru. The engine features the Subaru Active Valve Technology and there is a 6 speed gearbox. Extra colour Midnight black mica. What is not appreciated is that there is three different levels that the STi can be specified in standard 4 door format, not including the RA models listed below. There is the top of the range GL with the front Suretrack LSD, HID headlights and dark smoked rear passenger windows. The EL has the front LSD but no HID or rear window smoking. The KL misses out on the front LSD and rear wing as well. 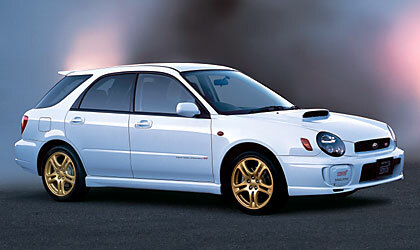 The STi S was released in February 2001 in direct competition with the EVO 7 due to the other models not being able to compete on price. The main difference was a lower specification sound system. 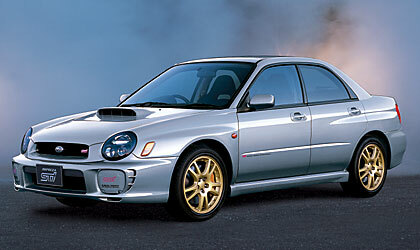 The STi 8 was announced in Japan in September, 2001. There does not seem to be many changes, but a new top of the range Prodrive Style model was introduced alongside. This model turns out to be very similar to the Tokyo Autosaloon exhibit from March with a WRC rear spoiler and rally style bumper mouldings where the foglight covers should be. The Prodrive Style also features an RA rally roof vent (unlike the European counterpart). To celebrate the 30 year aniversary of Subaru most models received special limted edition runs, and the STi was no exception. Featuring more torque than standard (up from 275 to 283lb-ft) and more than the 22B, the Limited Edition STi also has a higher rear spoiler (two extensions on the existing item) plus a front air dam.